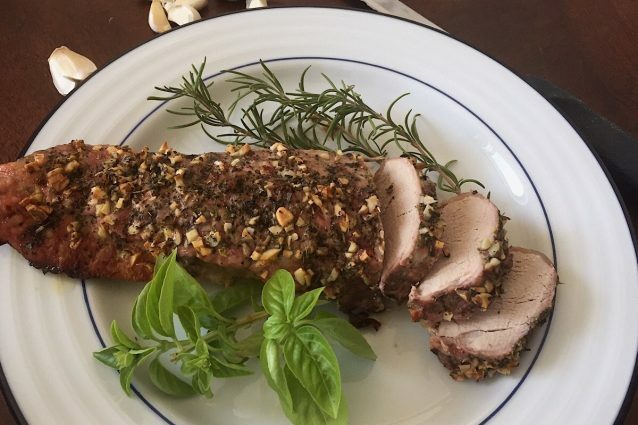 Making an amazing pork tenderloin does not have to be hard! This recipe will show you how to make a tenderloin that is full of flavor with little effort-it will be a recipe you will want to make all the time! Coated in garlic and fresh rosemary, this dish doesn't even need a sauce to go with it- it is already juicy and tasty enough! Serve alongside vegetables, couscous or any other side that you may love. This pork is perfect for any occasion! Place the pork tenderloin on a foil lined sheet tray or in a roasting dish. Stab the pork with a sharp knife all over. Sprinkle the pork with the salt, pepper and basil and then drizzle the white wine and the olive oil over the top. Roast the pork in a 350 ̊F oven for an hour, basting the meat with the juice every 15 minutes. Allow the pork to sit for about 15 minutes before slicing and serving. This will let the juices seal in the meat and prevent it from drying out. Serve while hot! If you have time, let the pork marinate when coated in the garlic and rosemary. Rub the spices in, wrap the pork and let it sit in the fridge for a few hours or overnight. This is a great way to let the meat become even more flavorful. Pork roll-ups: a tasty dinner idea!